Club Penguin Cheats by Mimo777 Club Penguin Cheats by Mimo777: Herbert's Revenge Early Review #1! 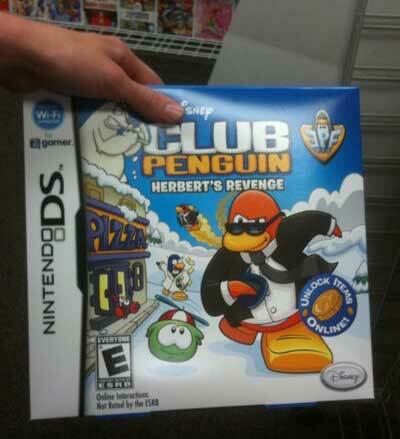 Ok, so far, except for the first mission, Herbert's Revenge is almost exactly the same as Club Penguin! Ugh! You have to do old Club Penguin missions to learn about Herbert. I am looking forward to something VERY exciting in this game. C'mon Club Penguin, I'm rooting for you! ***UPDATE: The Early Missions are pretty fun! Also, I found this cool Herbert's Revenge display box! Scroll down or Click here to watch my Herbert's Revenge Unboxing Video! HERBERT'S REVENGE MISSION 1 CHEAT IS DONE! HERBERT'S REVENGE MISSION 2 CHEAT IS DONE! HERBERT'S REVENGE MISSION 3 CHEAT IS DONE! HERBERT'S REVENGE MISSION 4 CHEAT IS DONE! HERBERT'S REVENGE MISSION 5 CHEAT IS DONE! oh :'( hopefully it will get better! Do you earn medals? Whats happening to the HQ? i can't believe you got it the day it came out!! im still trying to save my money to buy it while its on sale. So it's not that good? Oh and do I get a certificate making me an EPF agent like the first one? i have not got the game because it is not out here yet, but you would suppose so as after the veggie villain, there are unlikely to be more psa missions. Good for you! I already got it, and it rocks! Yeah it is! It is: epic, terrific, great... I shouldn't go back into this... XD Mimo, remember when I named all those colors for the puffle? XD That was beast! Yeah it is! It gets pretty fun later on! i hope i get tthe new game! it looks so cool! mimo i got it the day it came out! It blown up by popcorn. Play the mission or check Mimos post about it. Scroll down. LUCKY! I still have like 19 days... I feel neglected now... WHY?! WHY MUST THEY PUT US THROUGH THIS TORCHER?! The misions are all from cp except 1, 8, 9, and 10. I got it 2 days early!!!!!! 1. CP does not know what they are usually talking about with "rumors" so the sport shop is probobly going to be the new EPF HQ. 2. the sport shop is probably gone in the game, due to all this commotion on CP! Hey mimo, which one is the EPF symbol? or that metal thingy next to the penguin in the center of the screen.